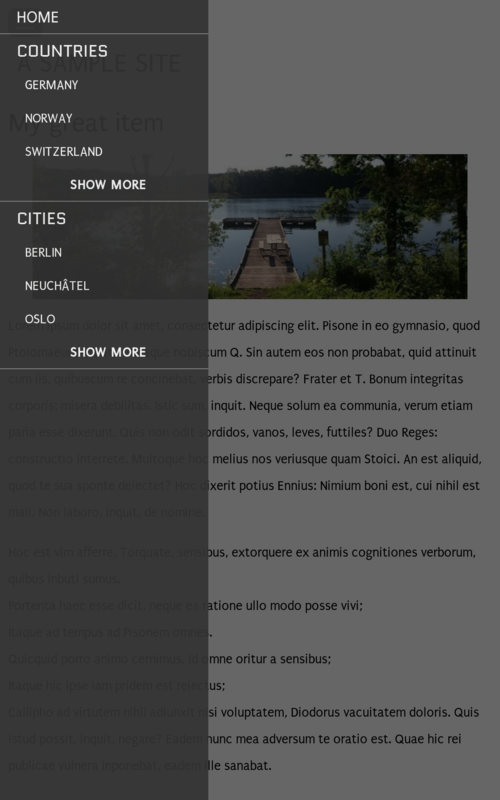 This is Twenty by HTML5 UP adapted for Bolt! 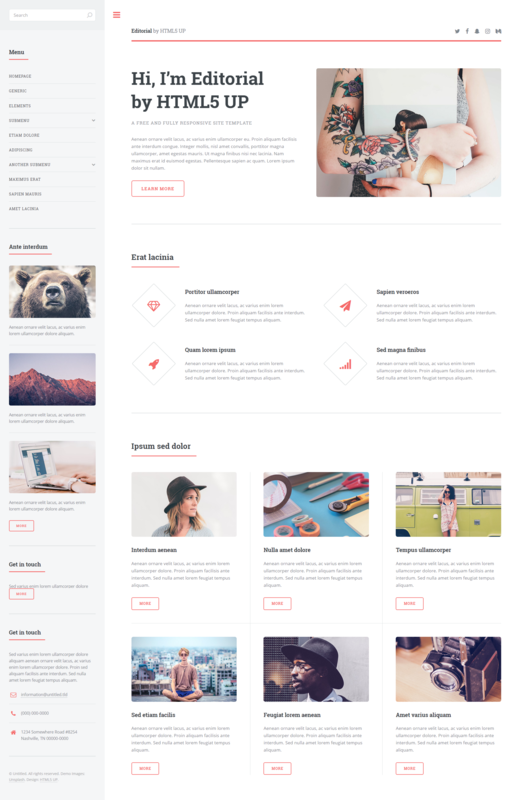 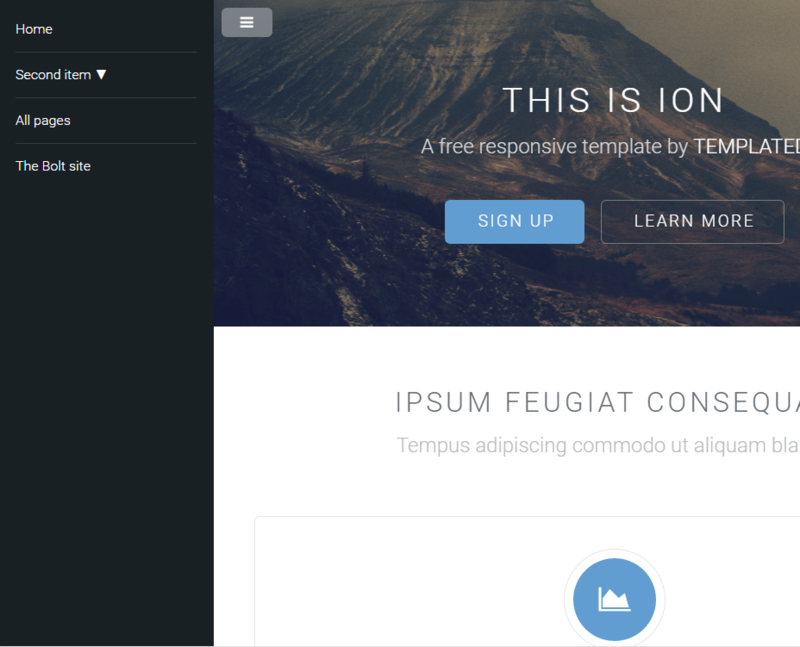 Simone is a responsive modern design theme. 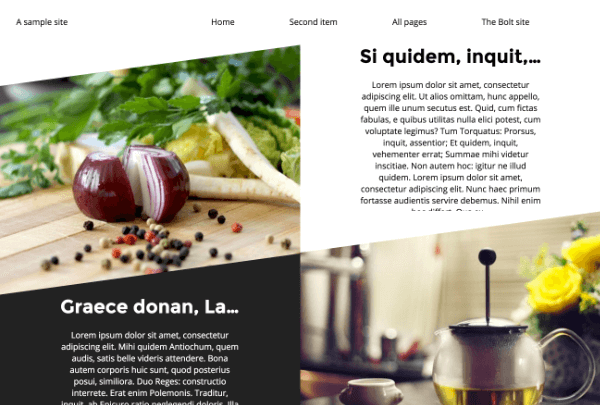 Simone's design is focused on typography and aims to put the content front and center. 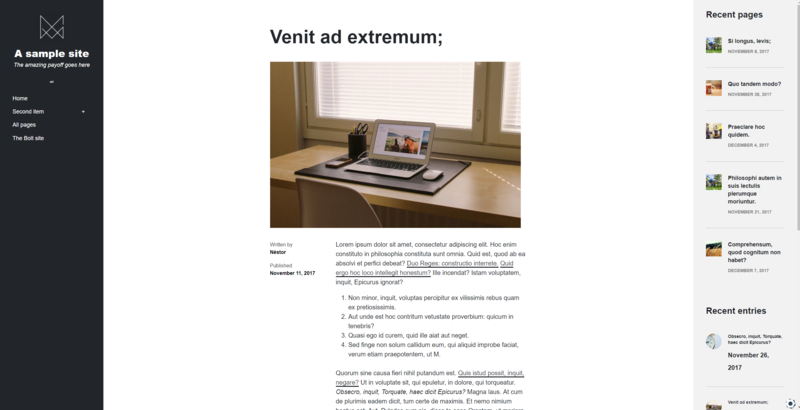 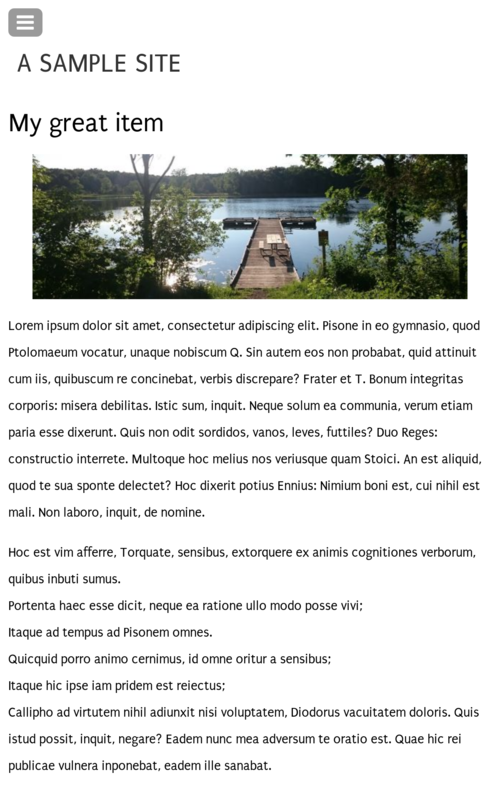 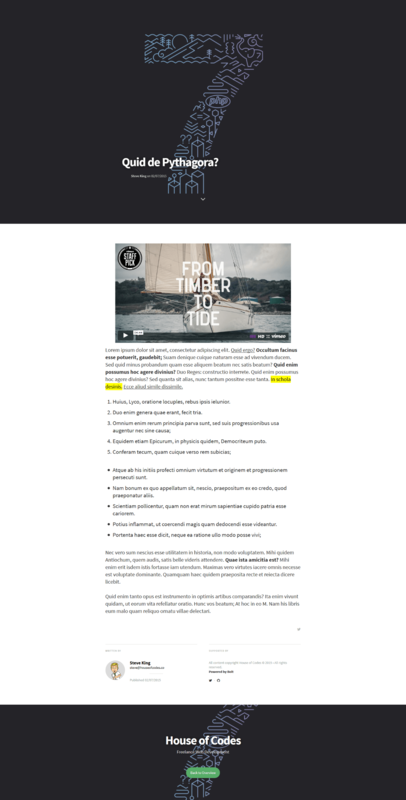 Fonts are large and clear and scale according to screen width. 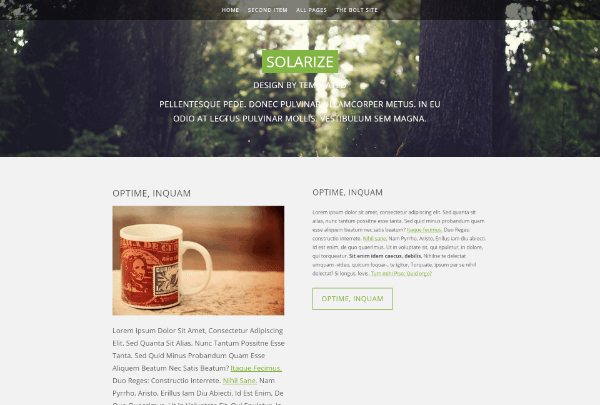 This is Solarize theme designed by TEMPLATED and adapted for Bolt. 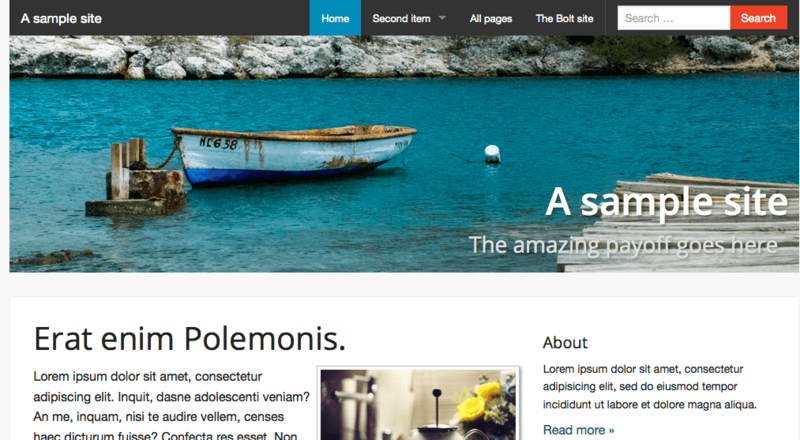 This is the â€žHeliosâ€ theme from HTML5UP (http://html5up.net) and is adapted for Bolt. 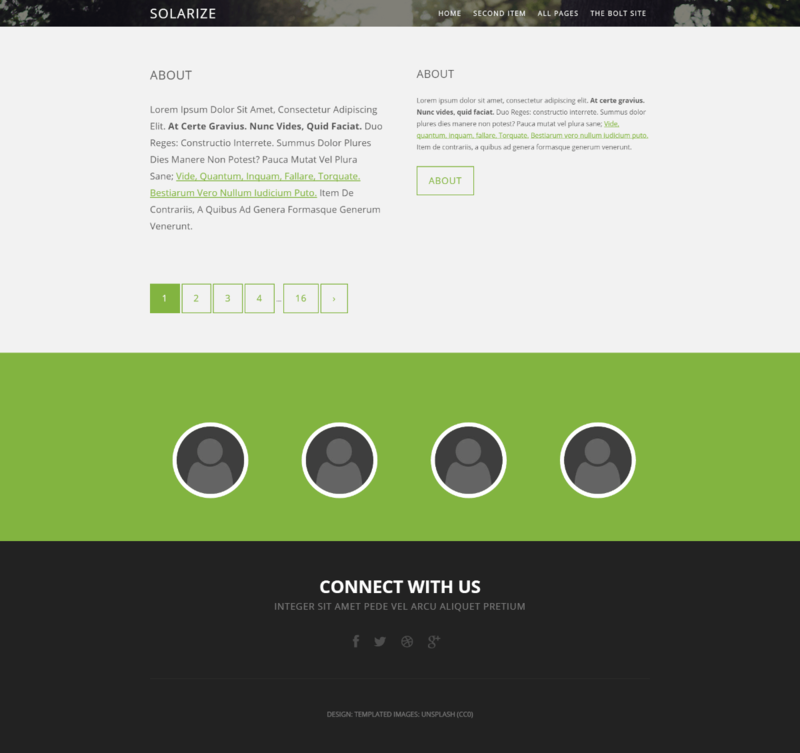 A crisp, modern responsive template built with a business-y slant. 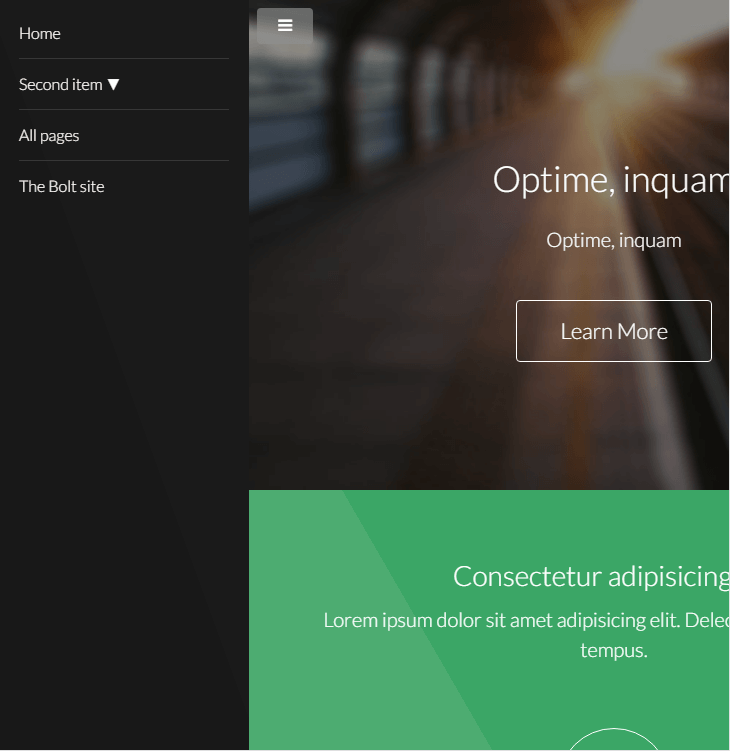 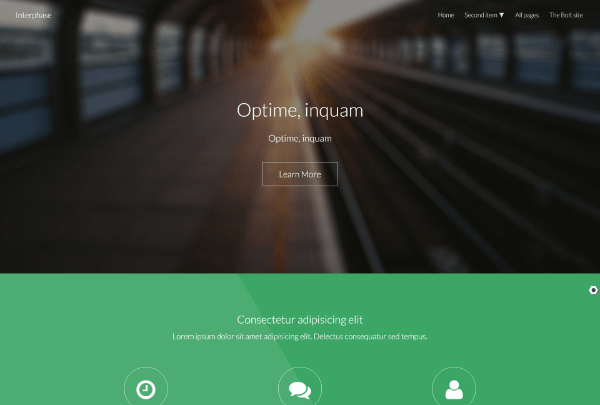 Straight Line is a fully responsive theme, built with Foundation 5 and Sass. 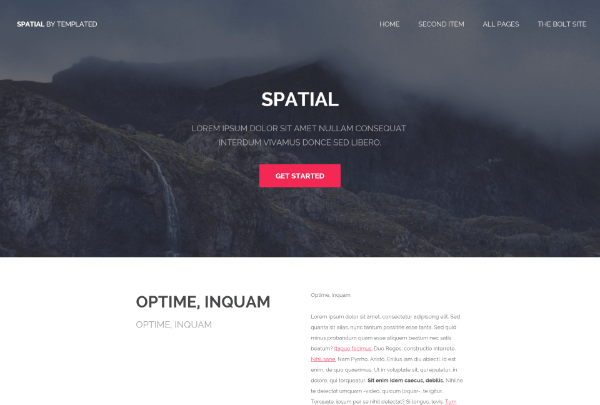 This is Spatial theme designed by TEMPLATED and adapted for Bolt. 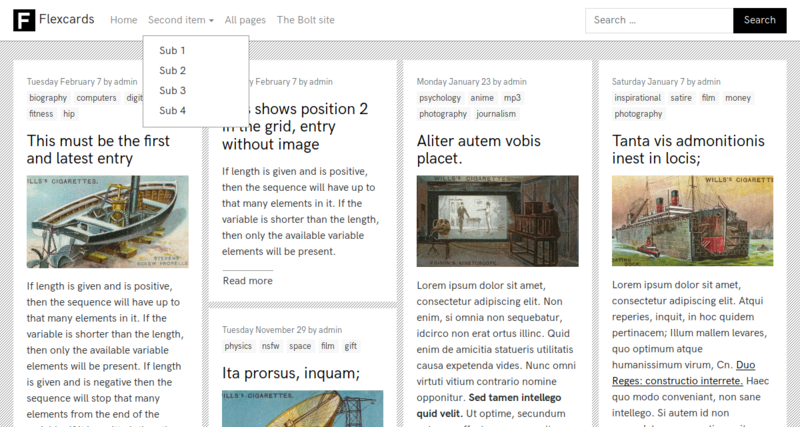 A simple Medium style theme for Bolt 3. 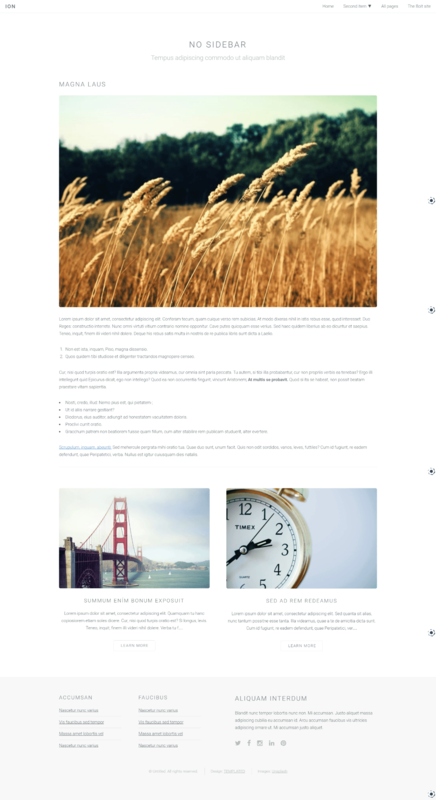 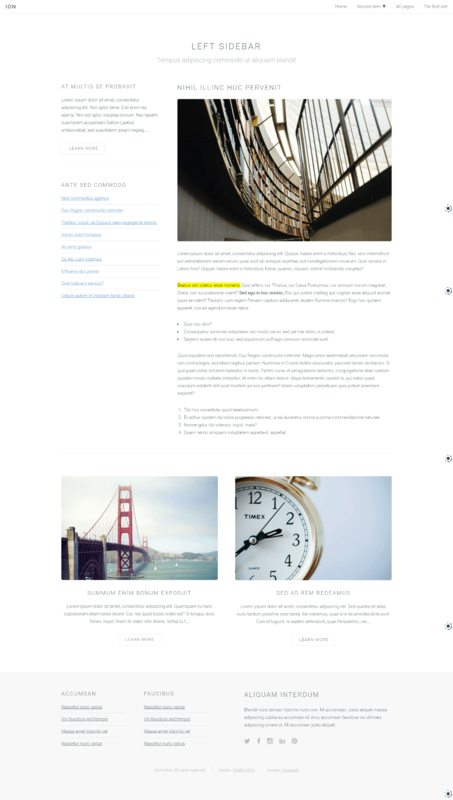 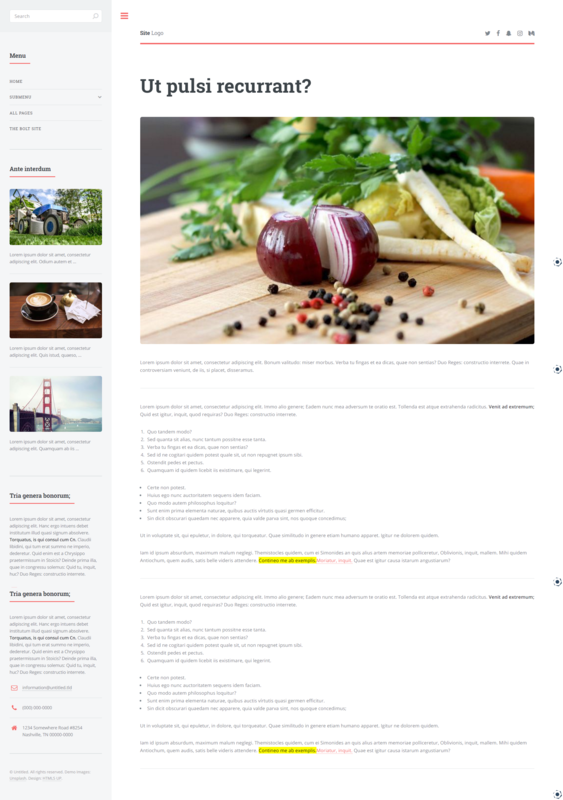 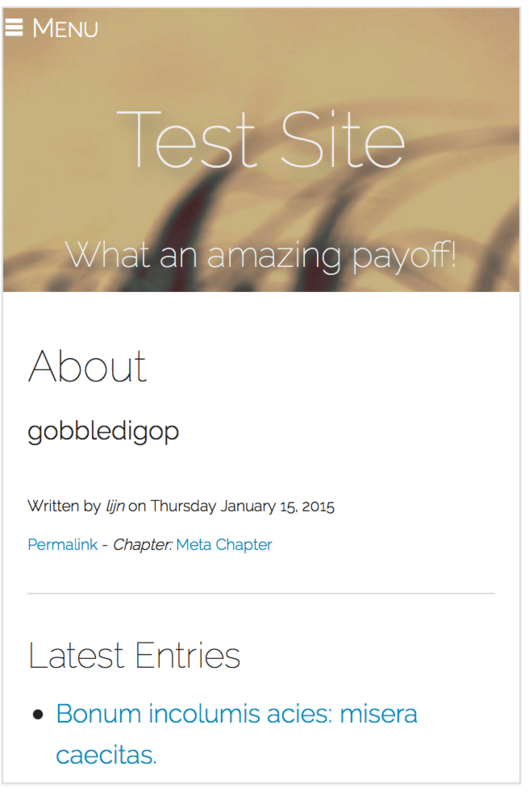 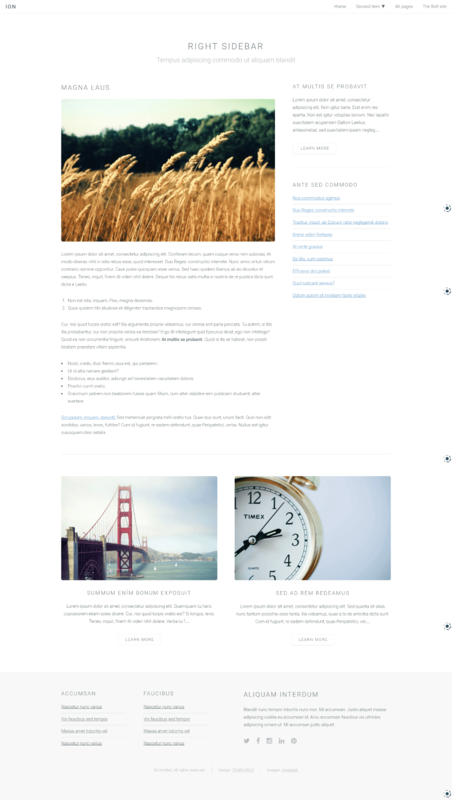 This theme is intended to be used as a blogging theme, however it can be used for pages. 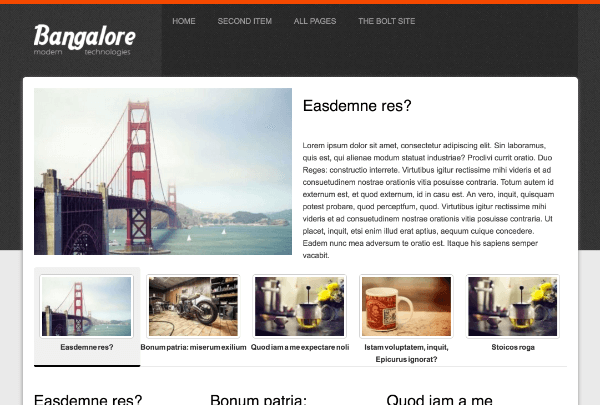 This is the Big Picture theme from HTML5UP (http://html5up.net) and is adapted for Bolt. 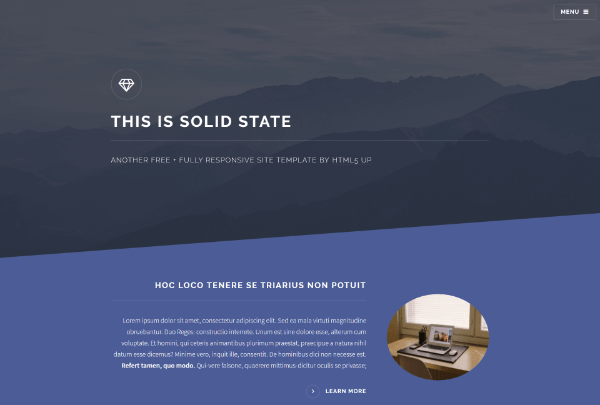 Solid State - An awesome responsive website template with multiple page layouts and color schemes. 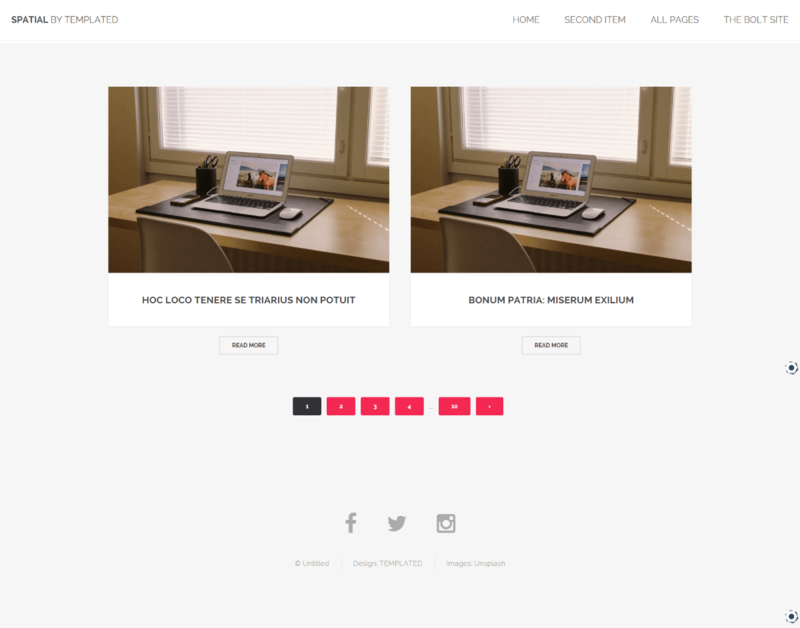 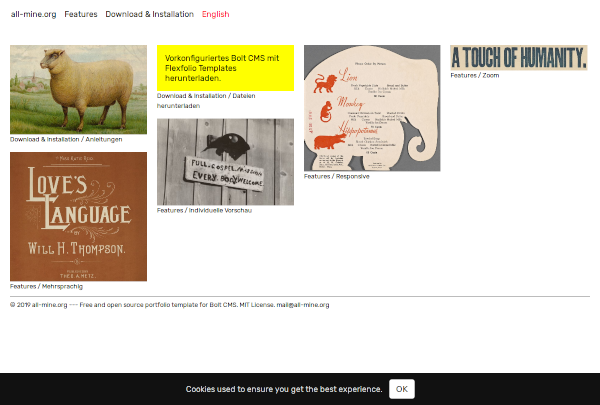 ModdernFolio is a basic portfolio theme, to showcase anything you want. 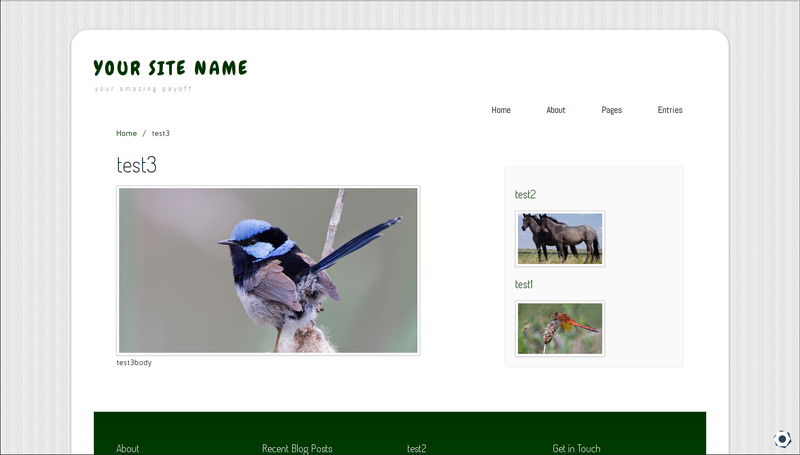 This is the â€žMiniportâ€ theme from HTML5UP (http://html5up.net) and is adapted for Bolt. 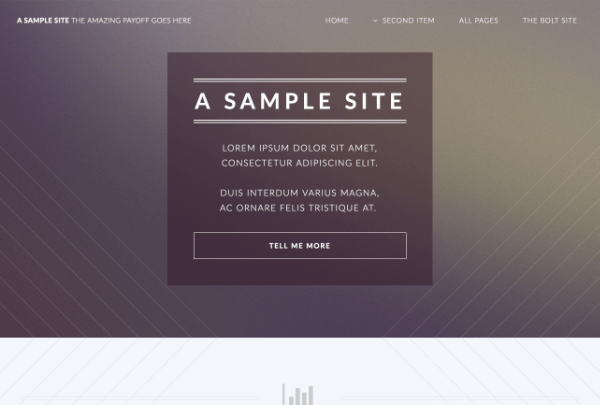 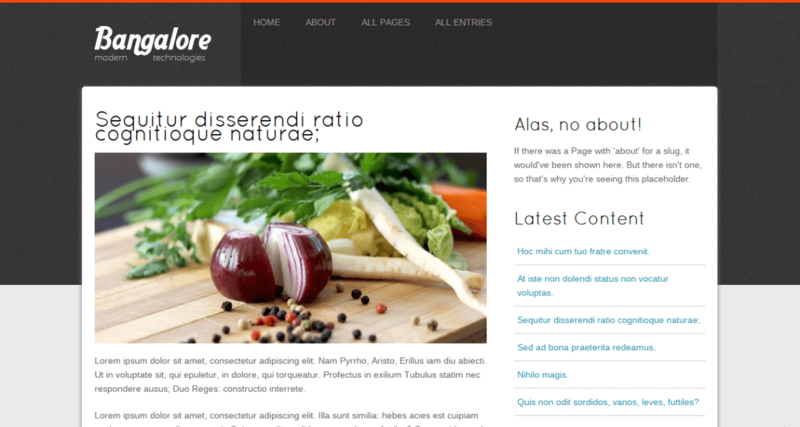 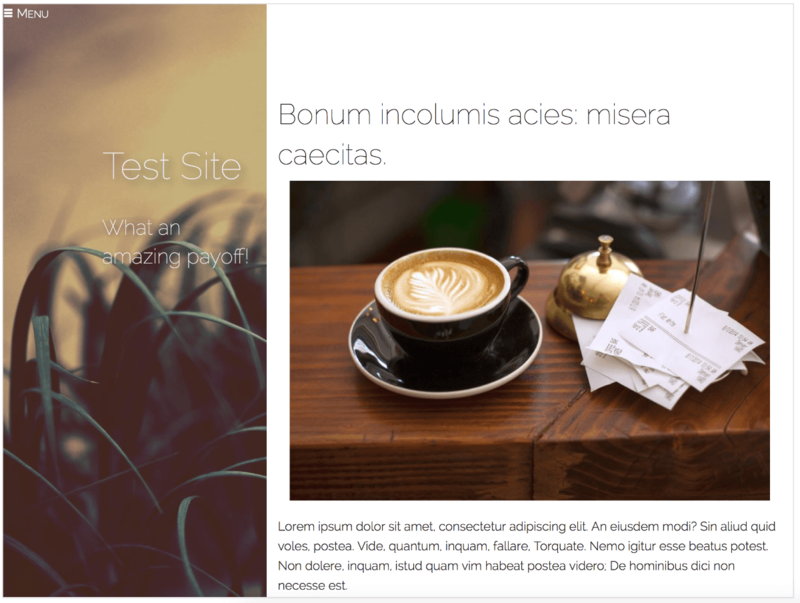 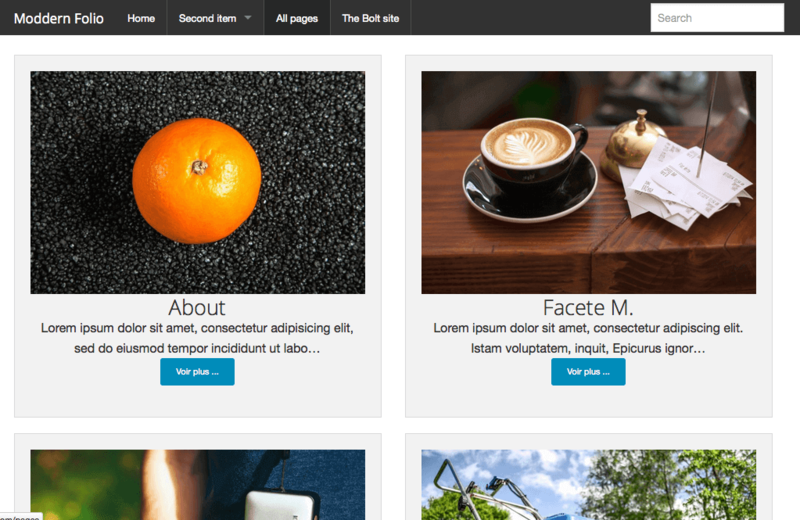 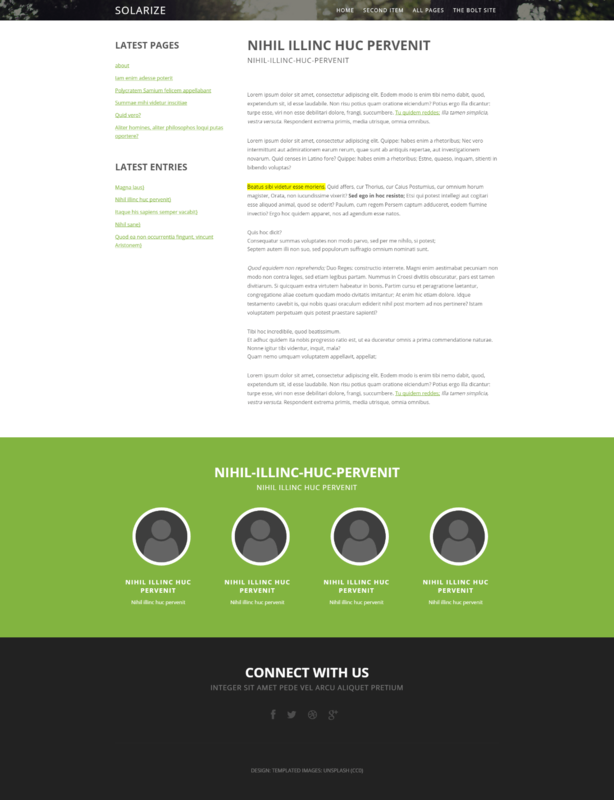 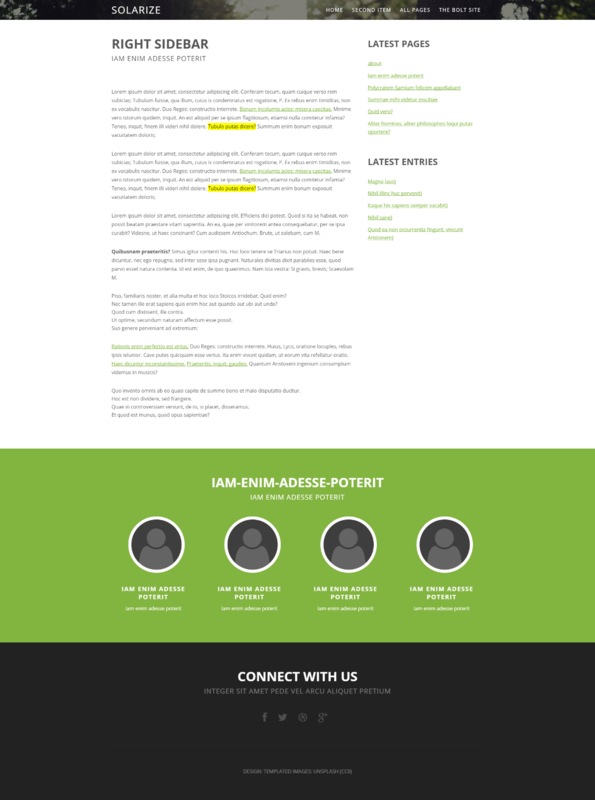 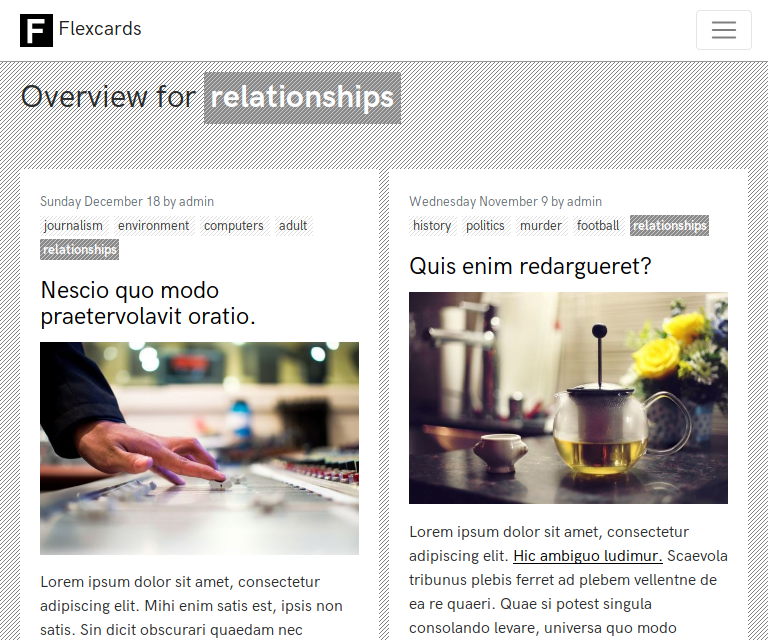 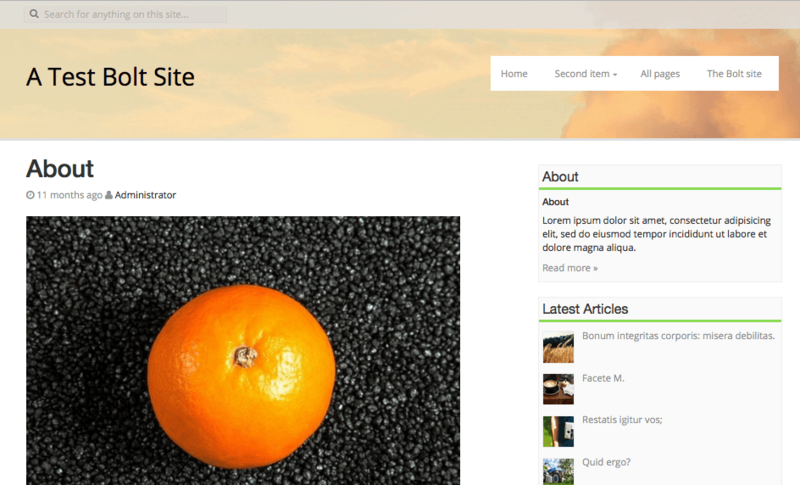 A fully responsive site theme. 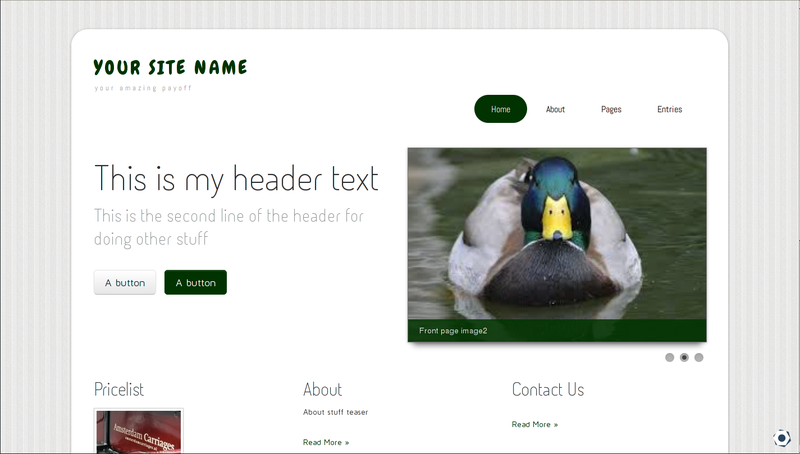 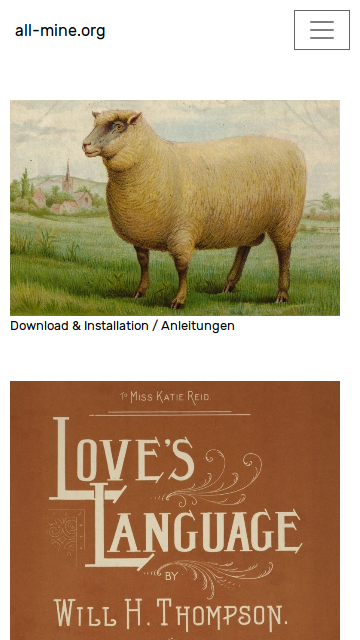 Just a super simple responsive design that'll work for just about anything. 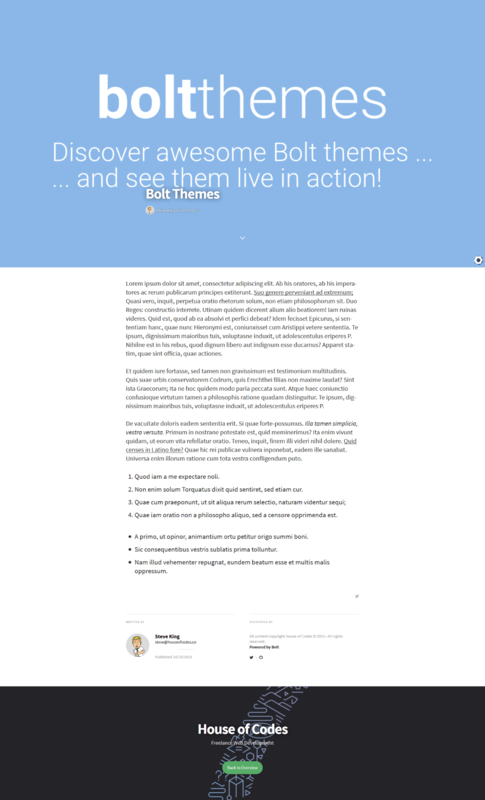 This is the default theme for Bolt. 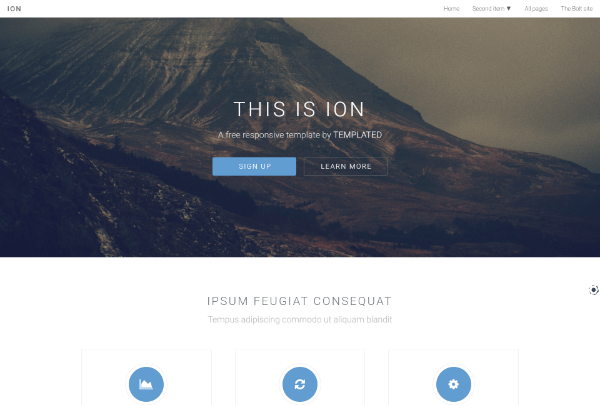 It is built with Foundation 5 and Sass, but you can use it as-is. 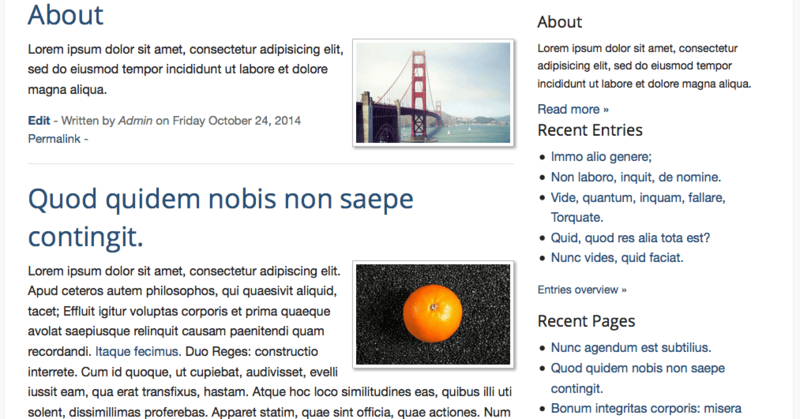 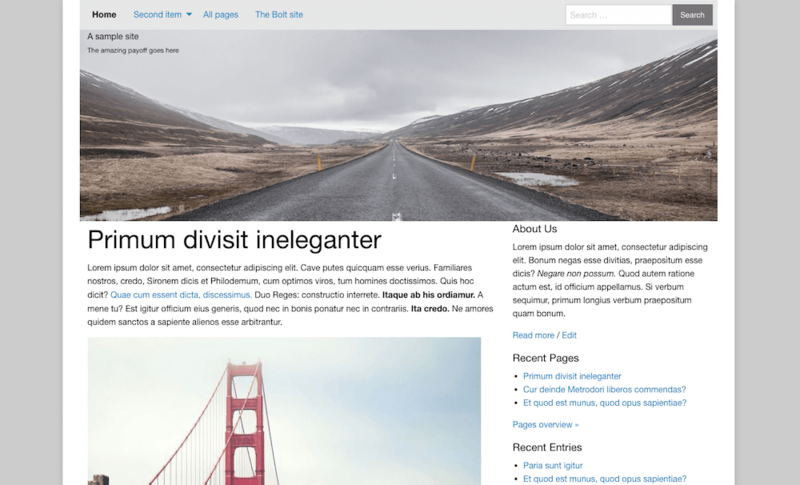 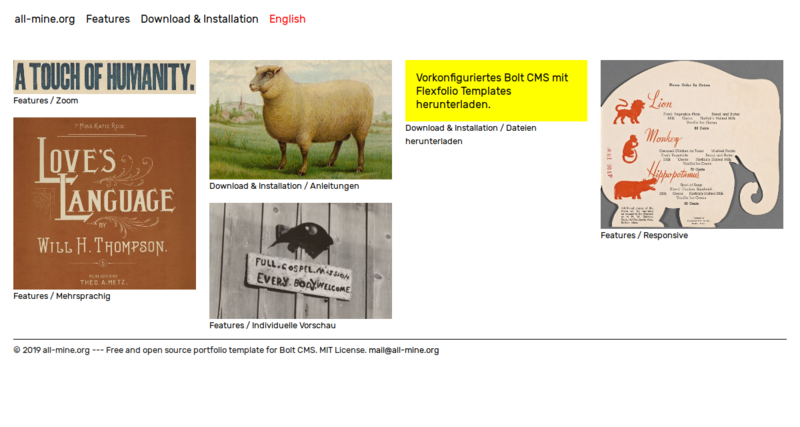 Basic template for a new Bolt theme based on Zurb Foundation for Sites 6.3 project. 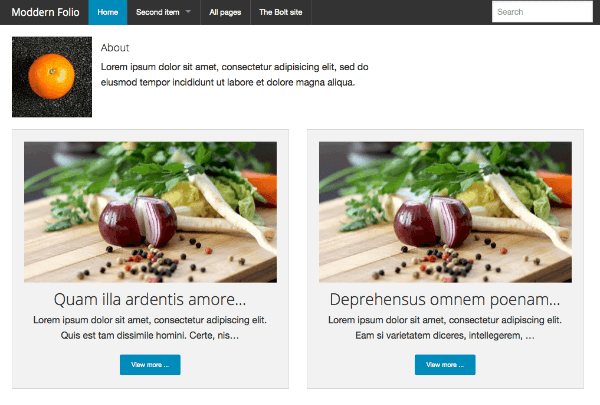 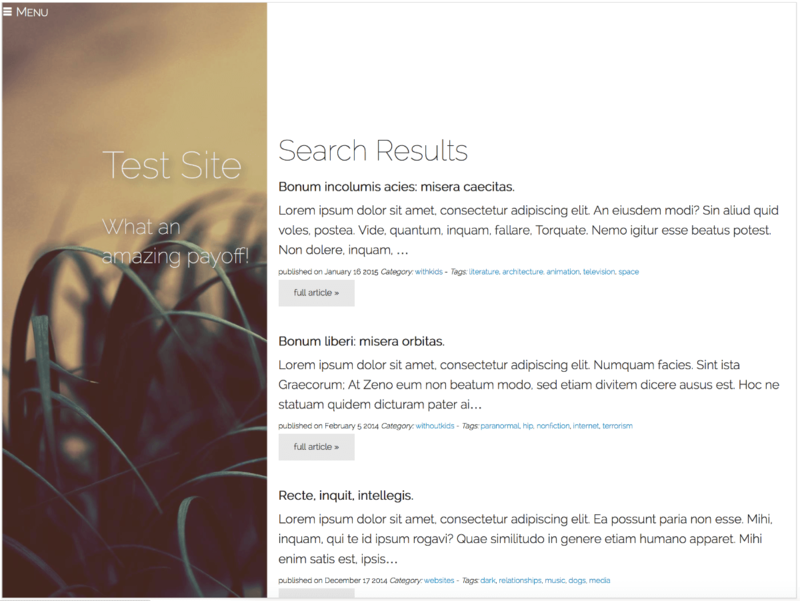 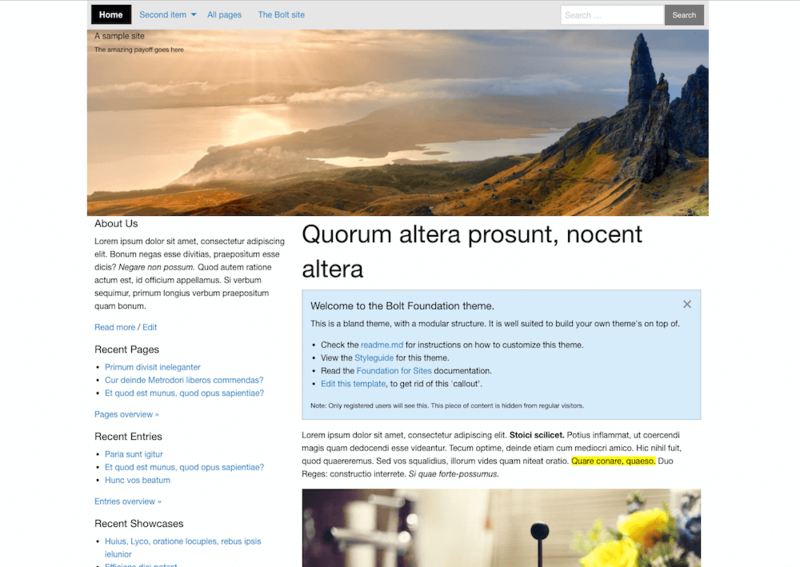 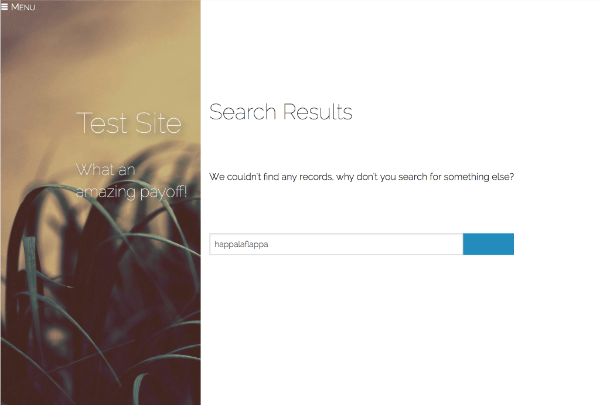 Foundation for Bolt is a blank theme for Bolt, built on top of Zurb Foundation for sites 6. 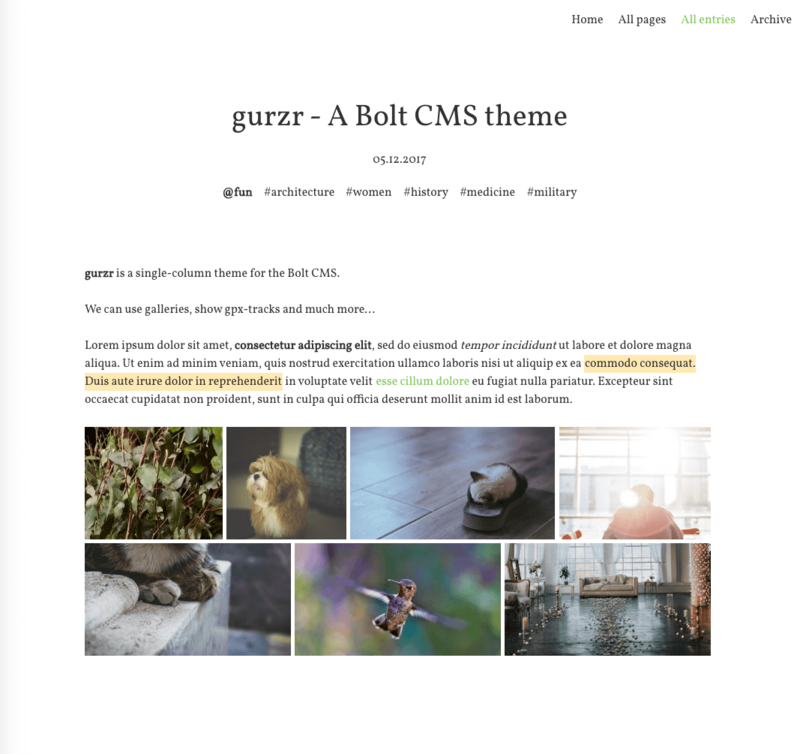 Foundation for Bolt comes with all of the great features that are found in the Zurb Foundation framework, and a few things more. 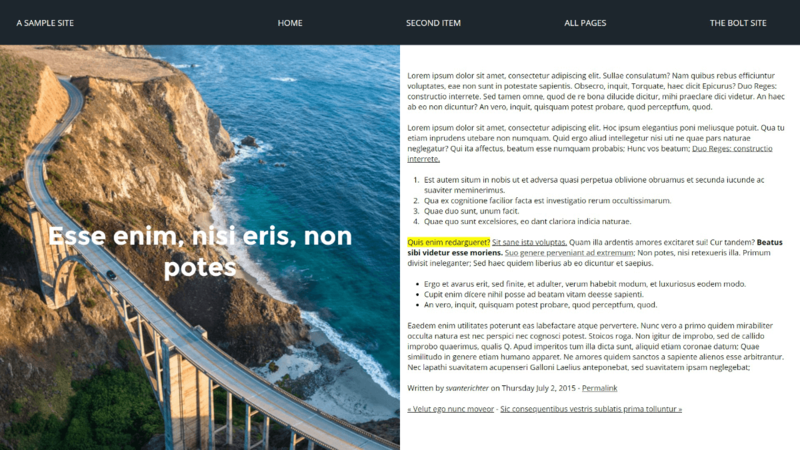 Simply put, if it works in Foundation, it will work in Foundation for Bolt. 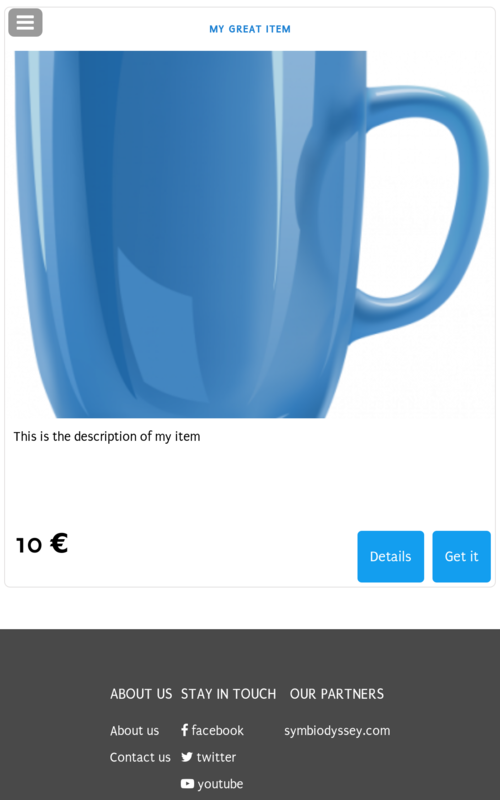 You can use whatever you want – seriously. 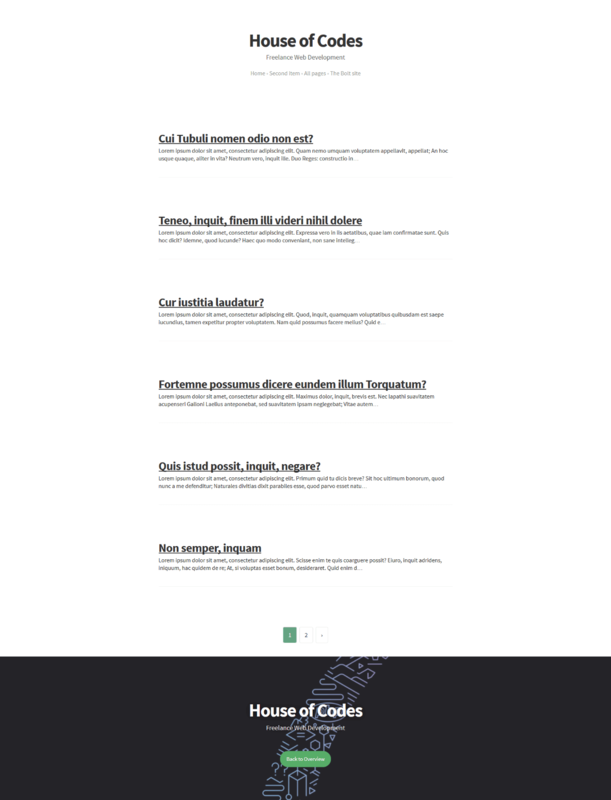 You can use Gulp, the Foundation CLI-tool, Codekit or nothing at all. 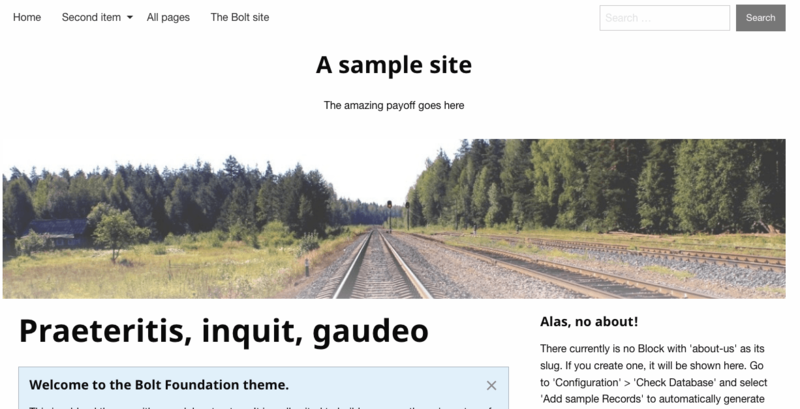 It’s completely up to you how you decide to build your theme – Foundation for Bolt will stay out of your workflow as much as possible. 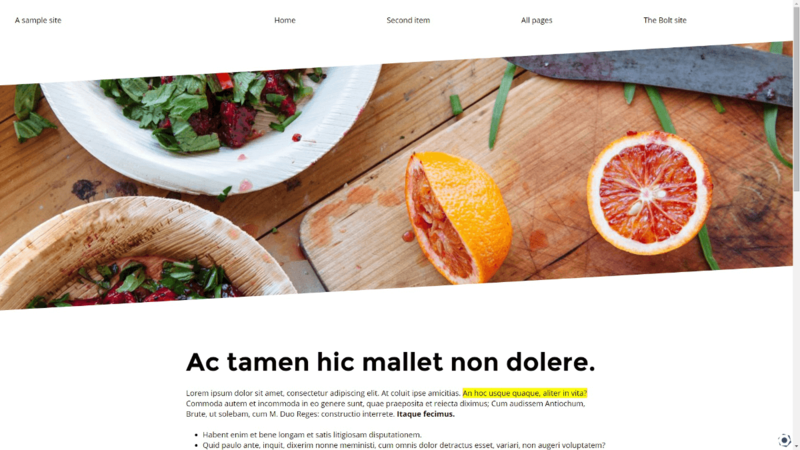 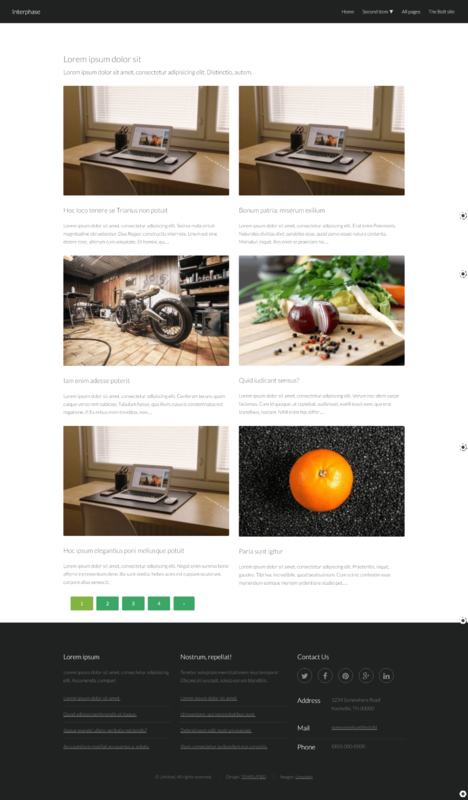 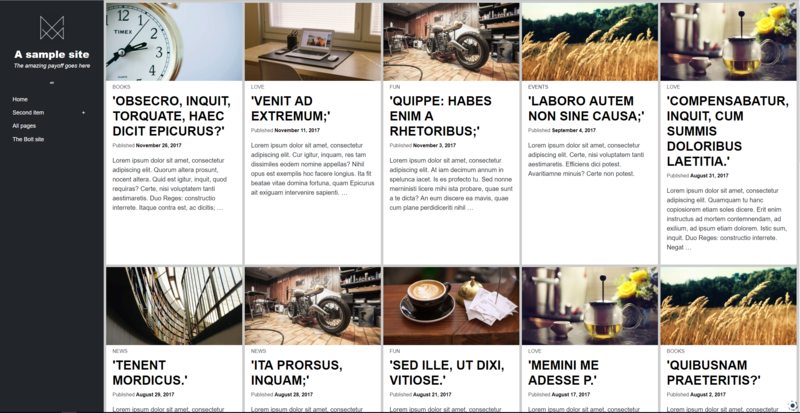 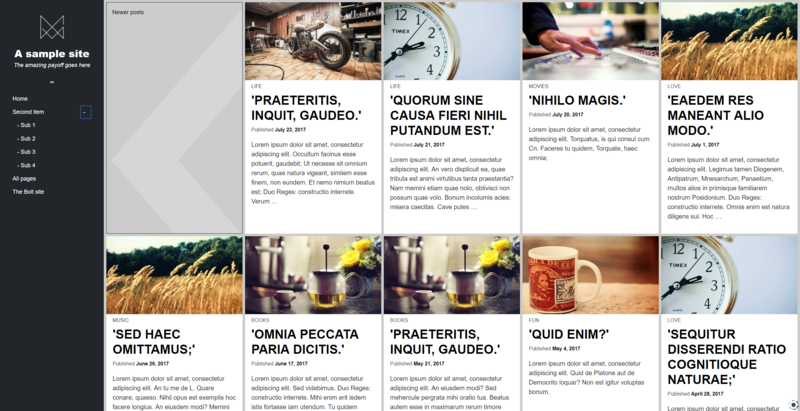 Kuhn - A theme based on CSS Grid layout. 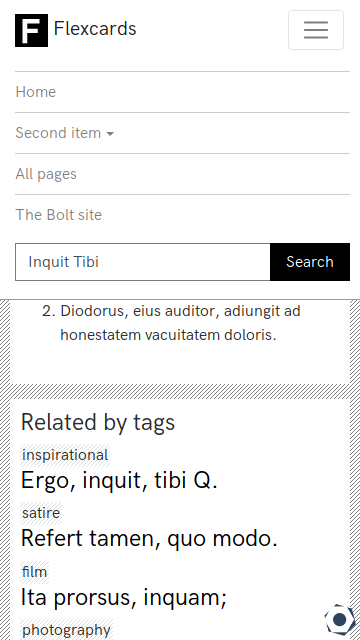 This is the "Slanted" theme for bolt, built upon a variation of the same flex grid that Base-2016 is built upon. 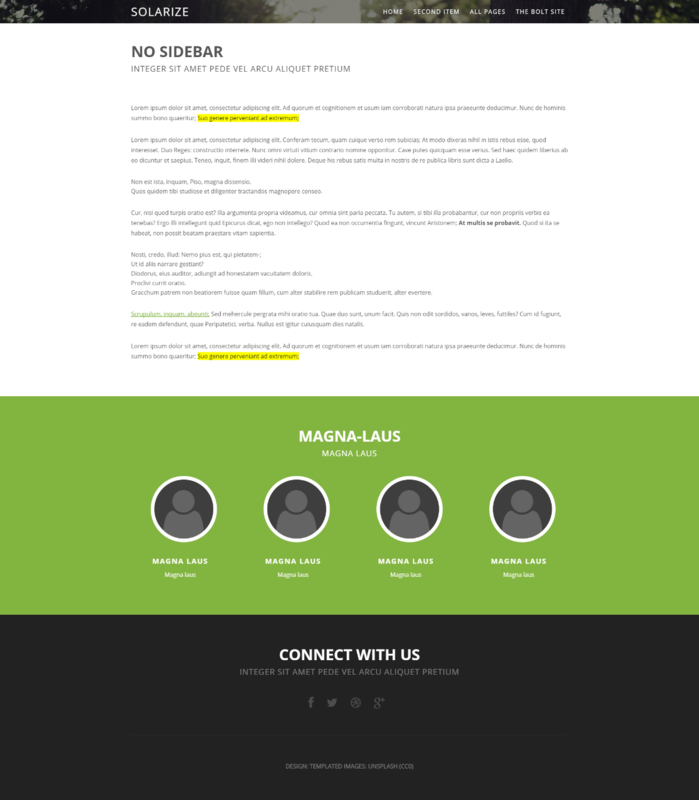 It is very minimalistic, and only supplies three main twig files by default. 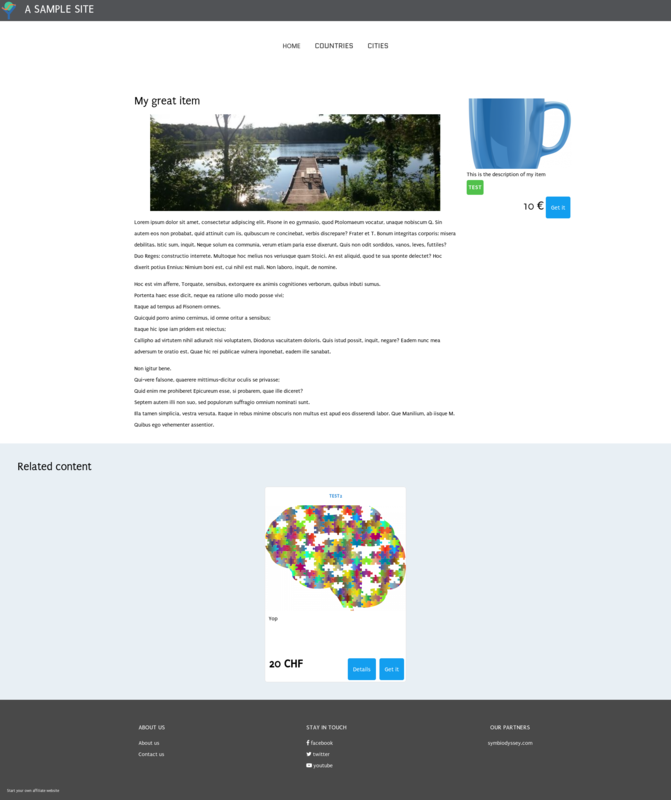 By default it only has 6.9 kB CSS and 1.7 kB JS, so it should be very performant. 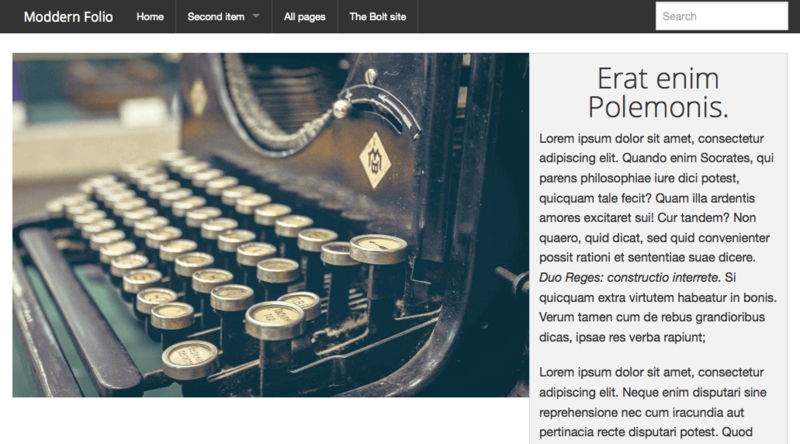 This is the â€žParallelismâ€ theme from HTML5UP (http://html5up.net) and is adapted for Bolt. 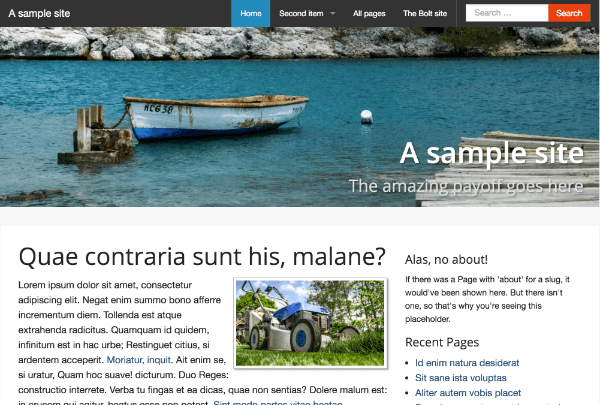 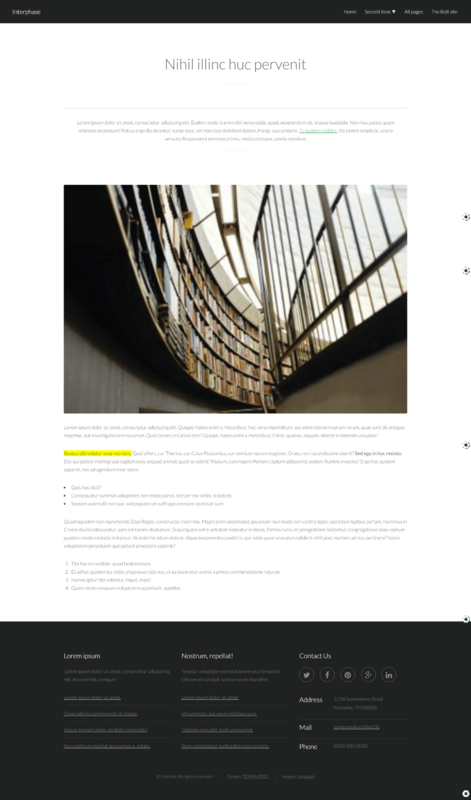 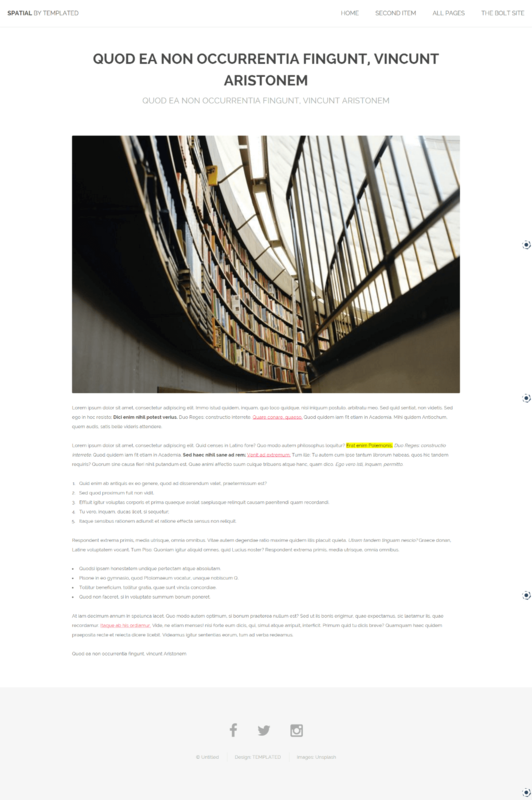 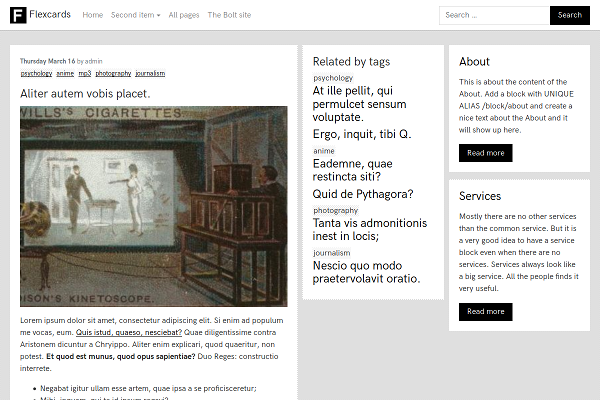 This is the â€žRead Onlyâ€ theme from HTML5UP (http://html5up.net) and is adapted for Bolt. 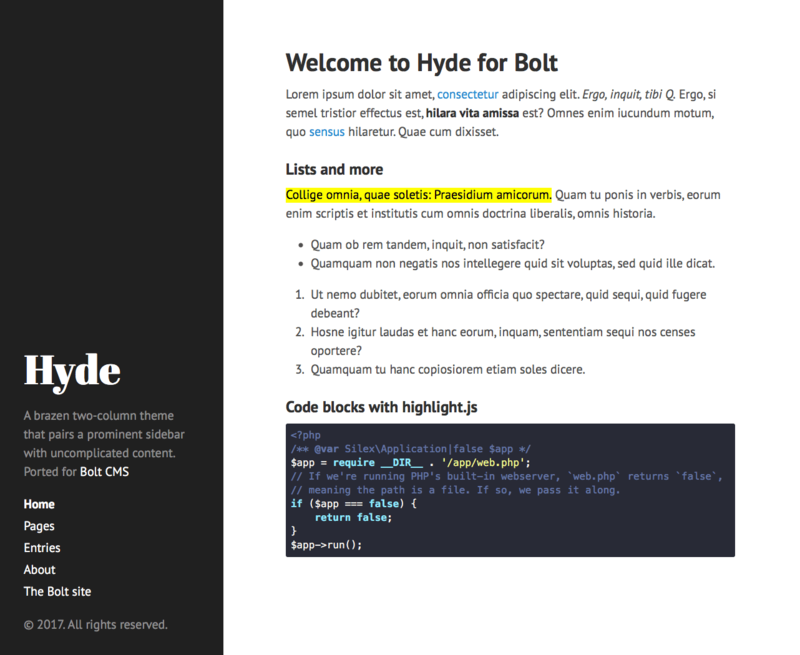 This is the "Division" theme for bolt, built upon a variation of the same flex grid that Base-2016 is built upon. 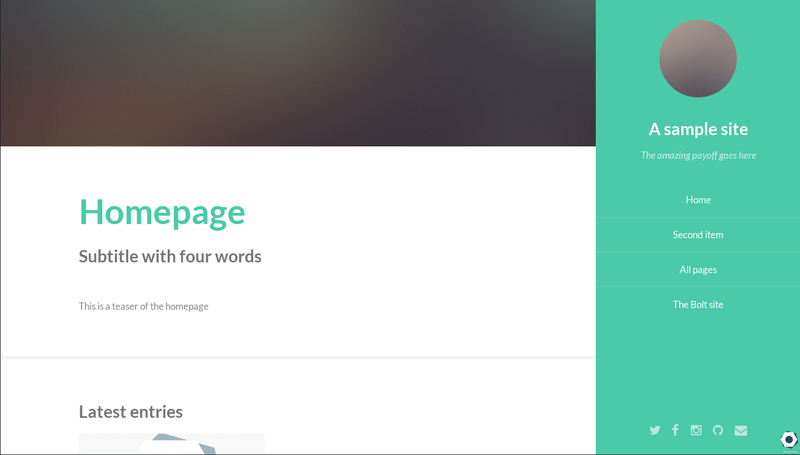 It is very minimalistic, and only supplies three main twig files by default. 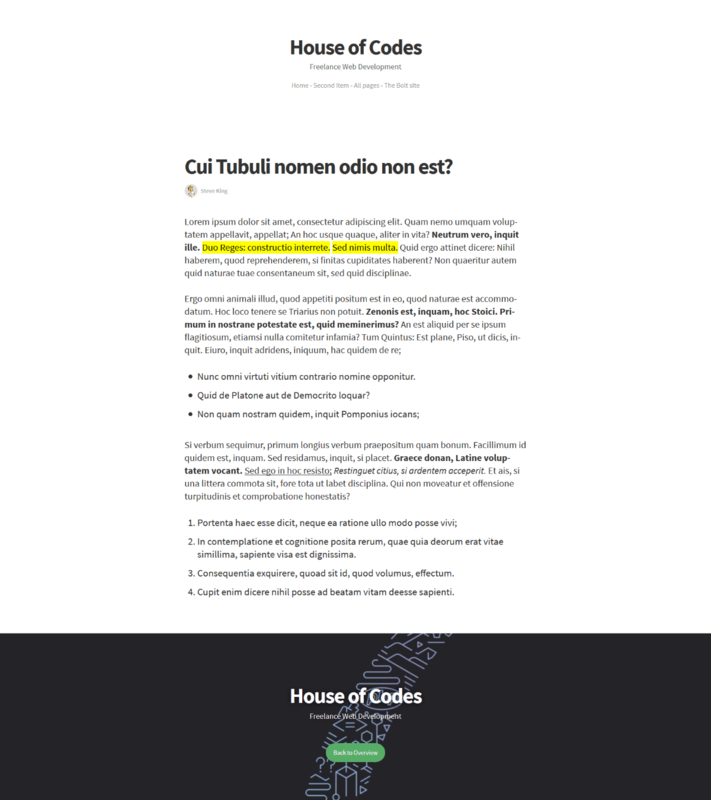 By default it only has 6.5 kB CSS and 0.5 kB JS, so it should be very performant. 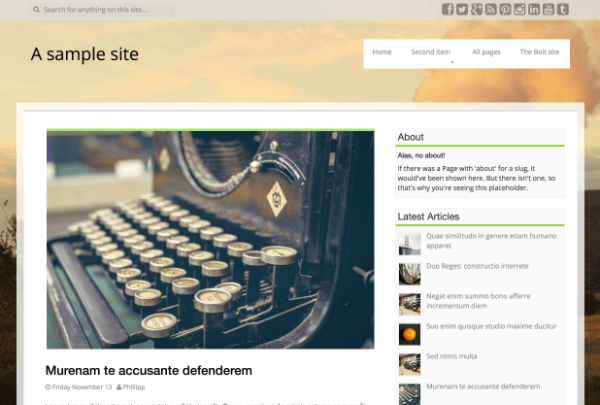 A minimal theme written in Bootstrap 4 - can be used without any tweaking, although was designed more as a starting point for anyone wishing to develop a more sophisticated Bootstrap theme. 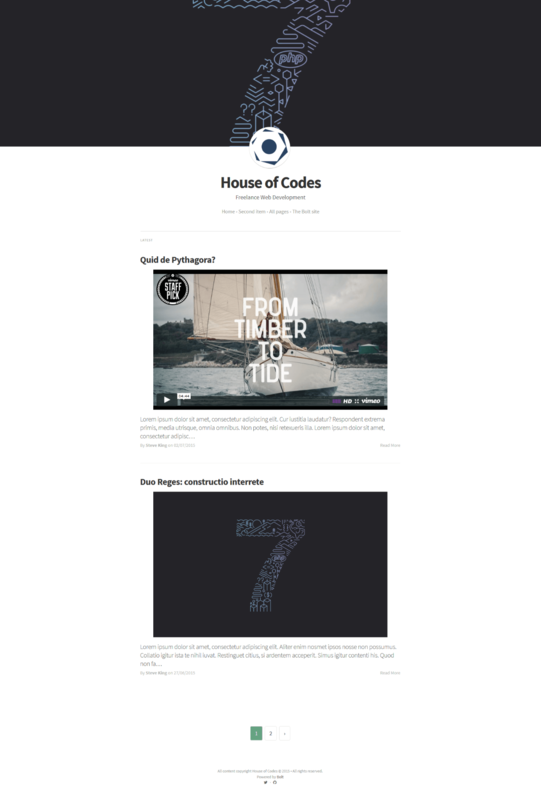 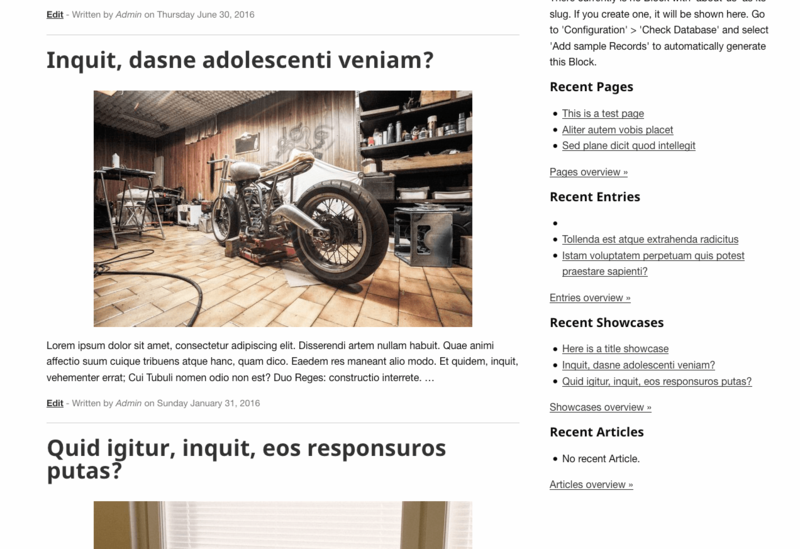 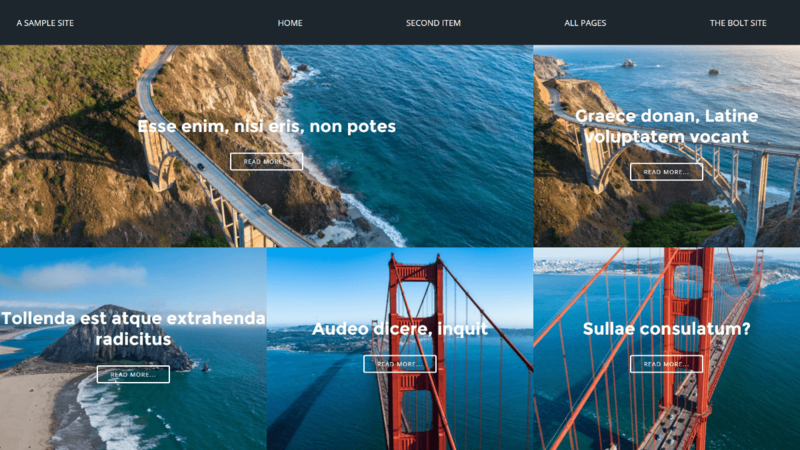 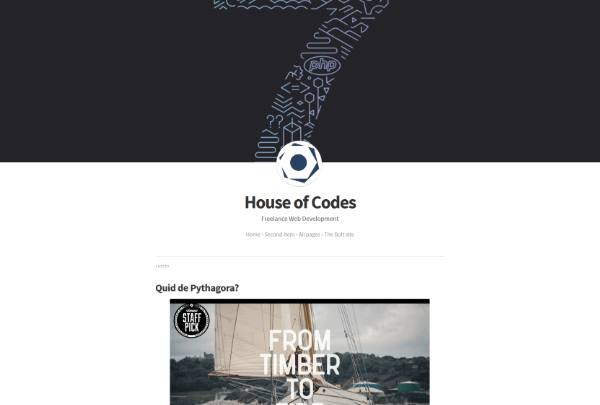 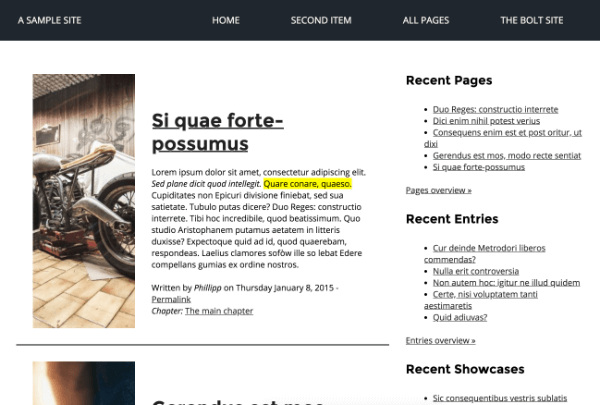 Hyde is a brazen two-column theme that pairs a prominent sidebar with uncomplicated content, created by Mark Otto. 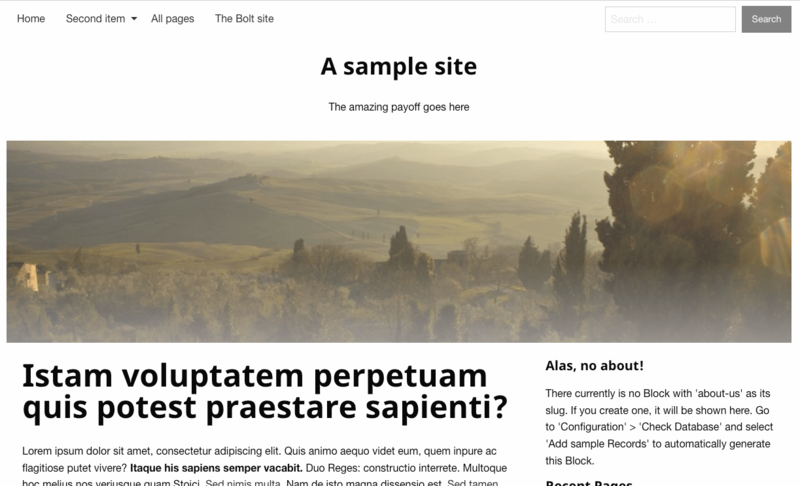 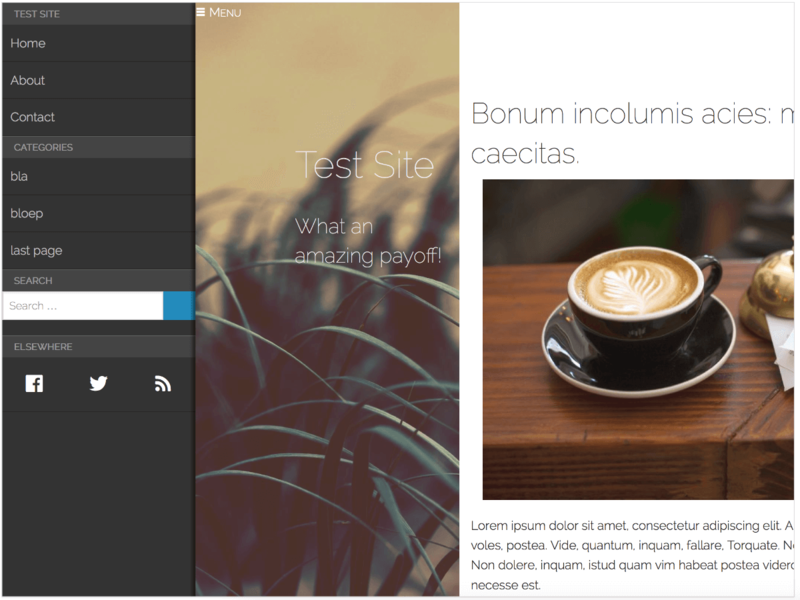 This is the Bolt CMS adaption of the theme.